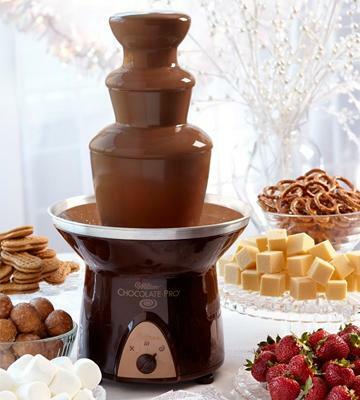 A high-capacity chocolate fountain serves lots of sweet delicacies for large groups of people. 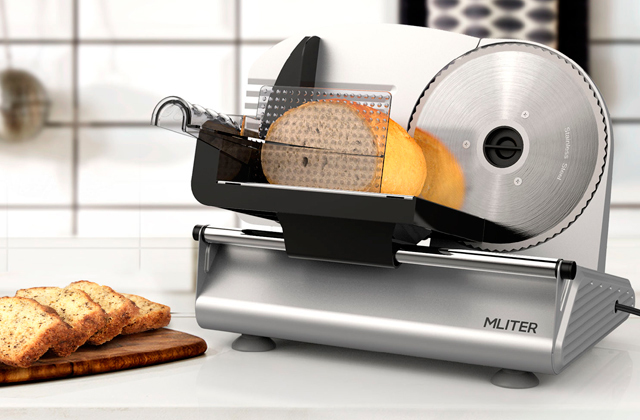 WhisperQuiet motor ensures an ultra-silent operation. This fantastic chocolate fountain is rather heavy. 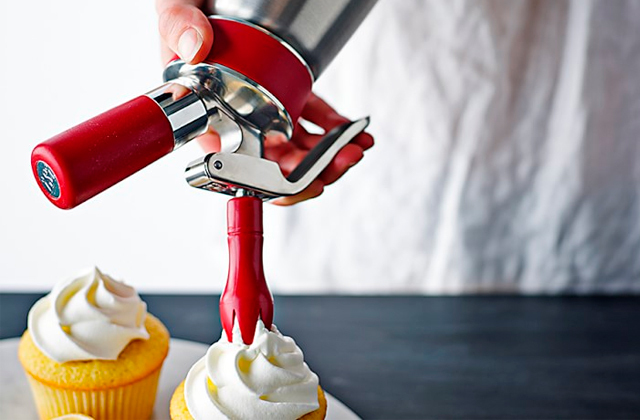 A perfect addition to a party or any other gathering for 30-40 participants. It will look magnificent on the table with fresh fruit, berries, pastry, and other sweets. A fountain with a smaller capacity is also available. 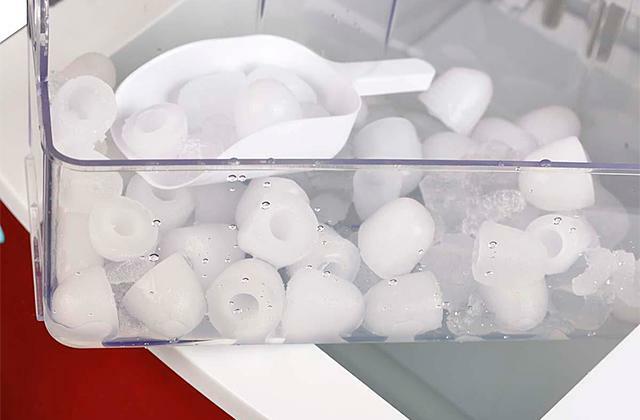 The bubble level will help you place the unit on a flat surface and adjust the fountain position for smooth operation. The fountain requires at least 4 pounds of chocolate for smooth operation. Wilton Pro chocolate fountain with a stylish design is a perfect choice for an event or a corporate party with 20-25 guests. It will create a wonderful, delicious, and casual atmosphere for communication. A lightweight and compact design of the Ovente chocolate fountain makes it highly portable, giving you an opportunity to take it to any outdoor event. A non-removable bottom bowl complicates cleaning. All guests at your party will enjoy the Ovente CFS43BR chocolate fondue fountain with a durable stainless steel construction. It will become a nice pick for any event with 10-15 participants. This model is available in stainless steel and red colors as well as in 12 inches height. An attractive Mickey inspired design will make the Disney fountain a spotlight at any children's party. The capacity of this chocolate fountain is a bit small. Both small kids and adults are thrilled to bits with this sweet thing. The unit's capacity is enough to entertain 7-10 guests. Disney DCM-50 is an ultimate choice for those seeking an extraordinary present for their kids. 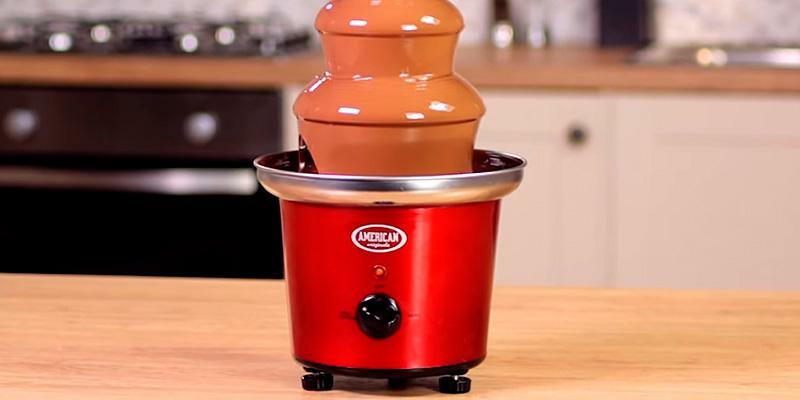 Thanks to a powerful motor, this chocolate fountain will delight you and your guests with a smooth continuous operation within 3 hours without a need to refill it with chocolate. The operation is rather noisy. A really amazing chocolate fountain that will become a spotlight at any party, celebration or just family get-togethers.With this lovely unit, 7-10 persons can enjoy the whole array of lip-smacking chocolate desserts. A decent choice! 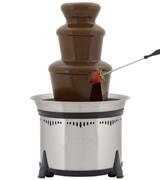 Sephra Classic Home Fondue fountain can make up to 6 pounds of delicious hot chocolate. Such capacity is more than enough for an event for 30-40 persons. No doubt, all guests will be delighted with a fabulous dessert. The 18-inch fountain will make it a real spotlight of any gathering or celebration. A chocolate dessert will attractively cascade over three tiers. The unit will decorate any wedding, birthday, corporate or children's party. 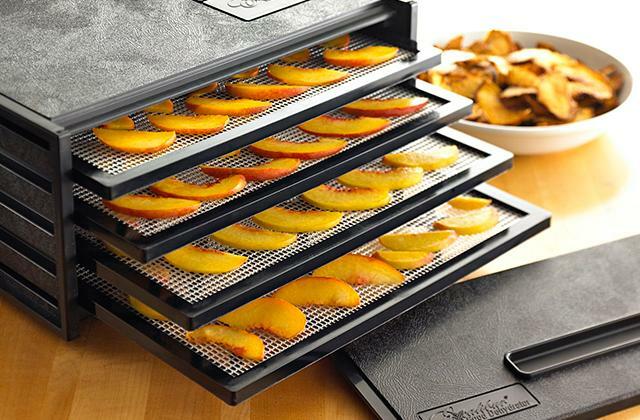 At the same time, you may choose a smaller version of this unit: 16 inches high and the capacity of 4 pounds. A perfect pick for 20-25 guests. This chocolate fountain features very simple controls. There is a Heat ON/OFF button on the casing. 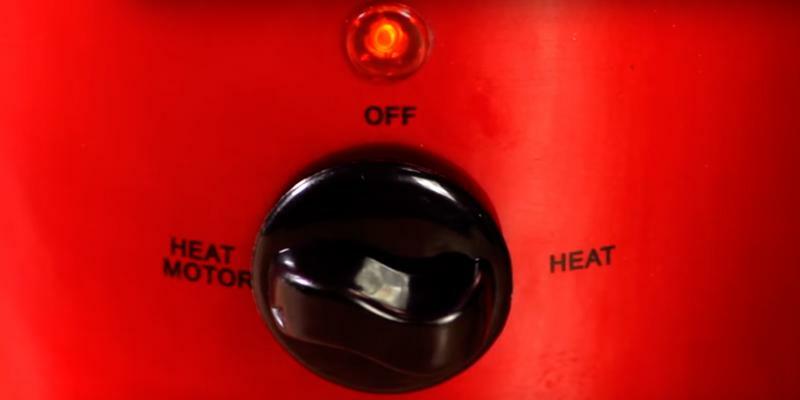 The heat button activates both the heating element under the basin and the motor. Melted chocolate is pumped up to the top and cascades down, creating a fountain. Then, the chocolate flows down to the bottom bowl where it is heated up and lifted again. 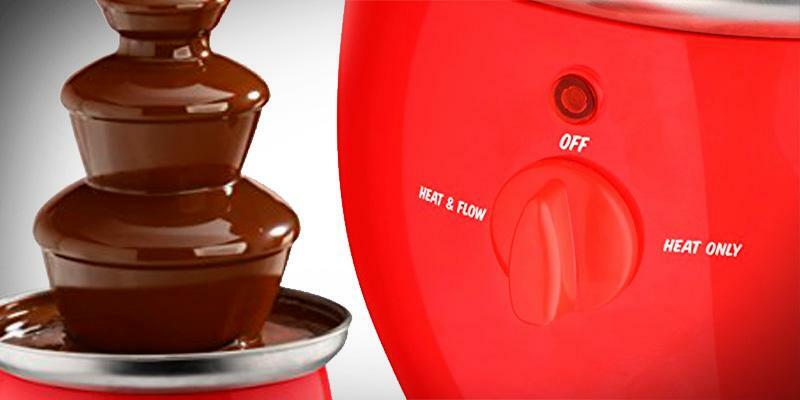 When the chocolate runs out or the party is over, the OFF button turns the fountain off. This model is compatible both with special and with pre-melted ordinary chocolate. This model is easy and convenient to use. It has adjustable feet to choose a steady position of the unit. 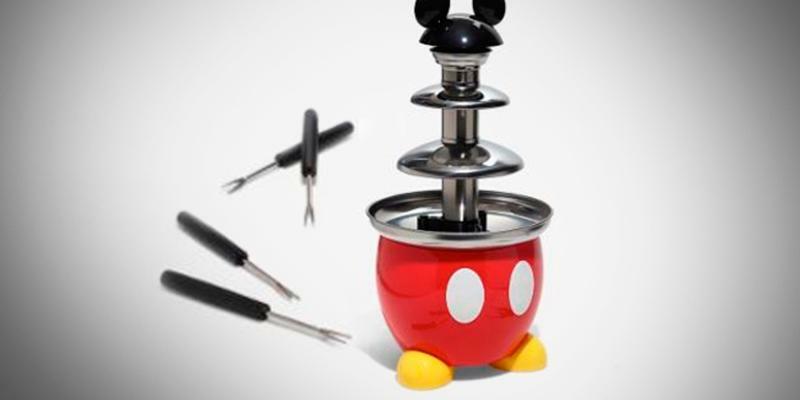 The package includes 6 metallic skewers for fruit, pastry, and other dippers. All the skewers are color-marked for every guest to remember his/her item. Also, there is another modification of this chocolate fountain that includes 10 plastic skewers. The casing is made of stainless steel and the tower is made of high-quality durable plastic. Therefore, the whole unit is quite heavy. Bear that in mind before setting on a trip with it in a bag! Sephra Classic CF18L-SST: 6 lbs. This is the real thing. Not too big but will hold about 4 lbs of chocolate. It is very elegant for small home parties up to 30 people (more if refilled). I poured chocolate in basin it didn't flow,reason was that it had an air bubble,turned off machine for 30 seconds then turned it back on and it started flowing slowly but barely.The problem was I only put 2lbs of chocolate so make sure you add at least 4lbs of chocolate. This fountain was simple to put together, quiet, and ran like a champ! At first, without the chocolate flowing through it sounded a bit loud. But, after the chocolate was flowing through it the fountain was quiet as a mouse. 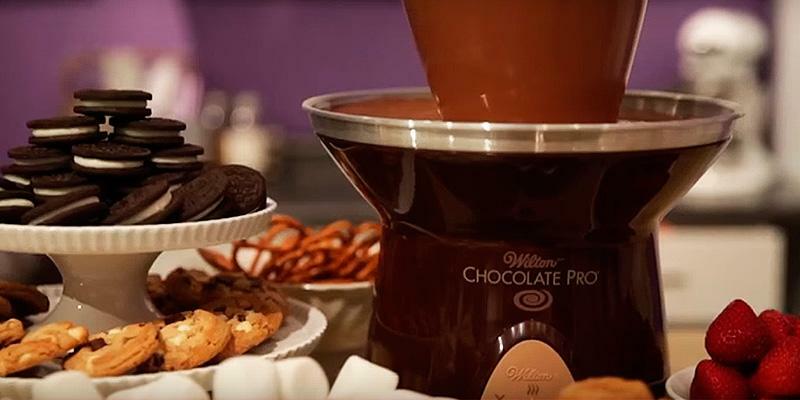 You can use Wilton Pro chocolate fountain for any celebration. It holds up to 4 pounds of melted chocolate, making it a perfect pick for the event with 20-25 persons. A magnificent and spectacular chocolate fountain is an excellent way to entertain your guests and taste some delicacies. The unit's height is 16.8 inches and the hot chocolate cascades over 3 tiers. It looks very attractive and fascinating! Even a child can operate this chocolate fountain. 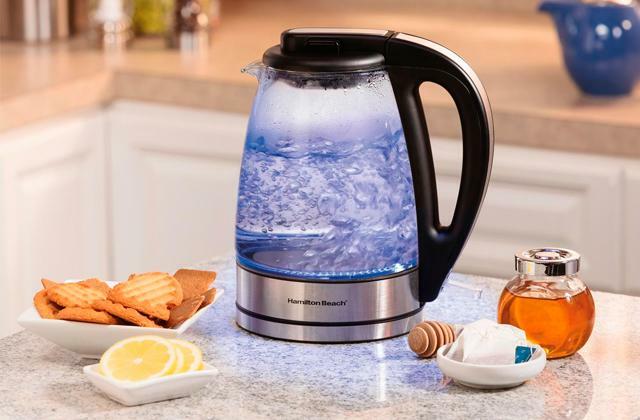 The front panel features a 3-mode mechanical switch for heating the bowl, motor start, and shut-off. You should use special chocolate, with high cocoa oil content and higher flow characteristics. At the same time, you may use ordinary chocolate pre-melted with 3/4 glass of cocoa butter. 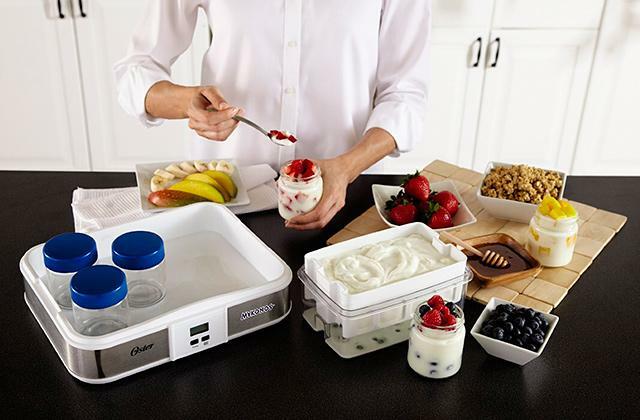 No matter what chocolate you use, the fountain will create an elegant flow for dipping you favorite fruit, berries and cookies. Similar to many other models, this fountain is very easy to operate. For steady installation, it has special adjustable feet complemented with a built-in bubble level to determine the surface flatness. Chocolate fountains operate smoothly only when they are positioned on even countertops. 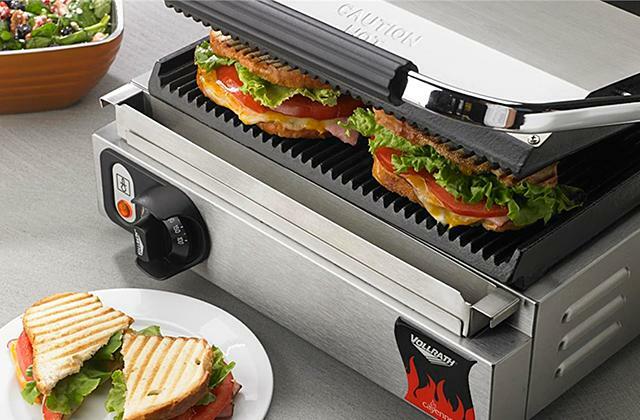 A high-quality heat-resistant plastic tower and an enameled metal body make the unit pretty heavy - 7.2 pounds. 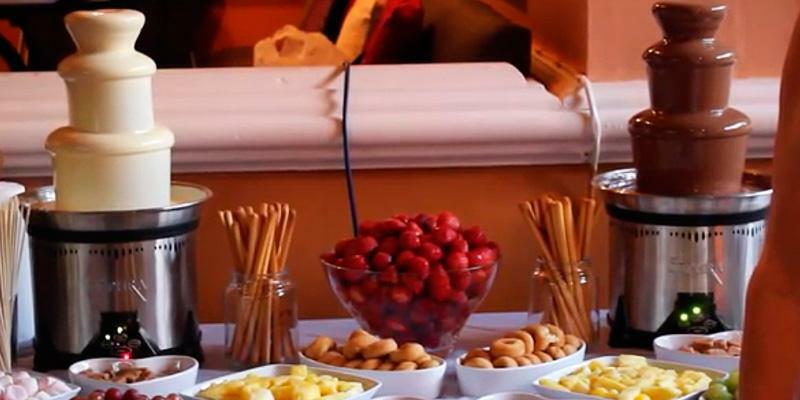 But if your guests like fondue, they will simply enjoy delicious hand-dipped desserts! I really appreciated that it was quiet, and didn't make a loud hum. Perfect for my party. I did use all four pounds of the Wilton Chocolate Pro chocolate melts to get the full "fountain" affect and as it was enjoyed by guests, the fountain affect began to fade, but that's to be expected with less chocolate. This fountain is SO much fun for a party! It's a good size so it really makes a statement on the table and it works very well. Today everybody wants to arrange a special and eye-catching party. 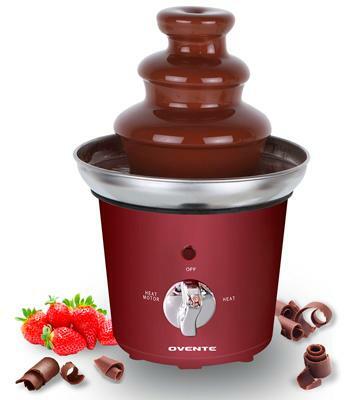 Ovente CFS43BR is an excellent home chocolate fountain for a family celebration. 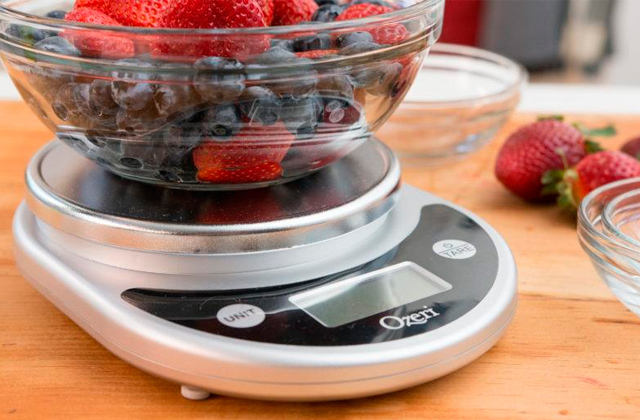 It is a compact 9-inch unit with 2 tiers. It holds up 2 pounds of melted chocolate - enough for 10-15 persons. The chocolate fountain will not only provide you with a delicious and extraordinary dessert but also promote off-hand communication. Hence, you can put it on a table at the office party for your fellow workers to relax and chat. 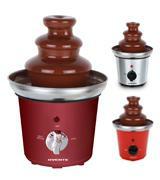 This mini chocolate fountain is available in 12-inch height and in different colors (stainless steel and red). It is one of the most user-friendly models. Turn the switch to Heat to start warming the bowl. In about 3 minutes, add some chocolate and turn the switch to the Heat Motor mode. Melted chocolate will start cascading over the tiers. When the celebration is over and all guests are out, simply turn the switch to the Off position. 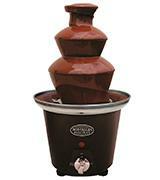 This chocolate fondue fountain is suitable both for special chocolate and for ordinary chocolate pre-melted with oil. Choose dark chocolate for sweet fruit, berries, and cookies, while milk or white chocolate perfectly complements to acid fruit. 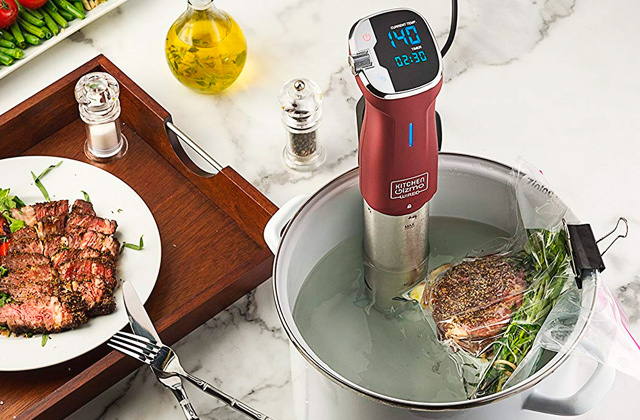 Ovente CFS43BR features a simple design and easy operation. The fountain has adjustable feet on the bottom of the base, so you can easily place the unit evenly on the surface. It is important to ensure the smoothest chocolate flow. The ON light indicator is available for your convenience. The base and the tower are made of stainless steel for high durability and long-term use of the unit. 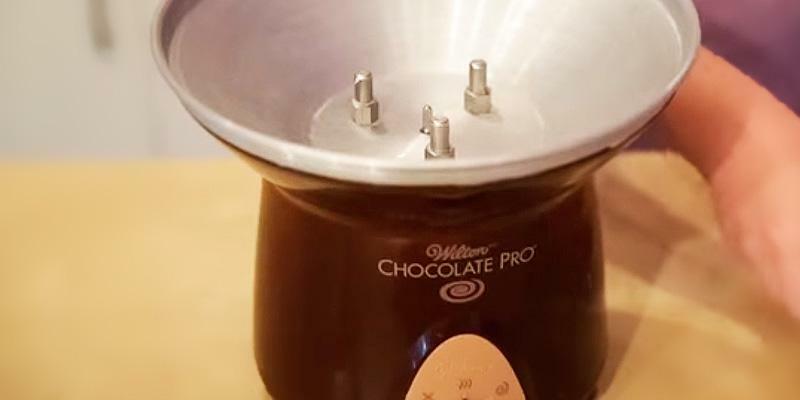 The chocolate fountain weighs just 1.8 pounds, so you can easily take it to anywhere you go. Sephra Classic CF18L-SST: 7 lbs. Worked great! Easy to set up, easy to clean! Big hit with adults and kiddos! Would recommend! PERFECT FOR SMALL PARTIES! Easy to use! This is a great little machine. It stands about 12 inches high. It was a huge hit at my daughter's 16 birthday and tonight for valentine's day. It is fairly easy to clean and assemble. I can see this being a center piece of awesomeness at any party. 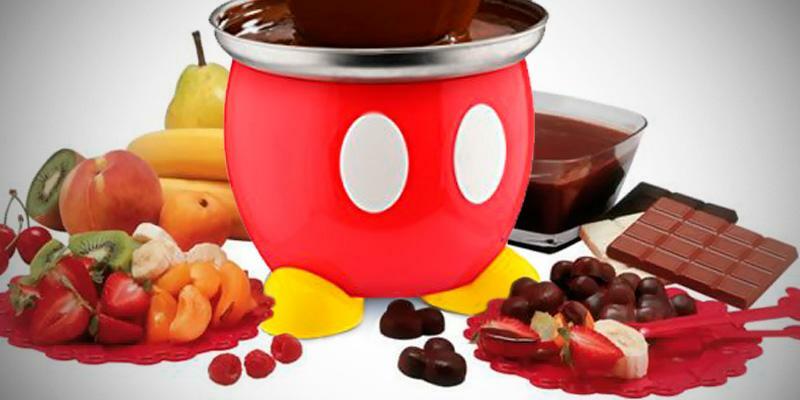 This chocolate fountain is inspired by the world-famous Disney hero, Mickey Mouse. It will become a key feature of any children's party, like a birthday party or a prom. Your children and their friends will be absolutely delighted at pinning fruit and dipping them in the cascading hot chocolate. Just imagine how spectacular and delicious it is going to be! The 15.2-inch fountain with a 3-tier tower is optimal for children. Even the smallest kids will be able to reach for the top. And the capacity of 1.5 pounds is perfect for a group of 7-10 kids. 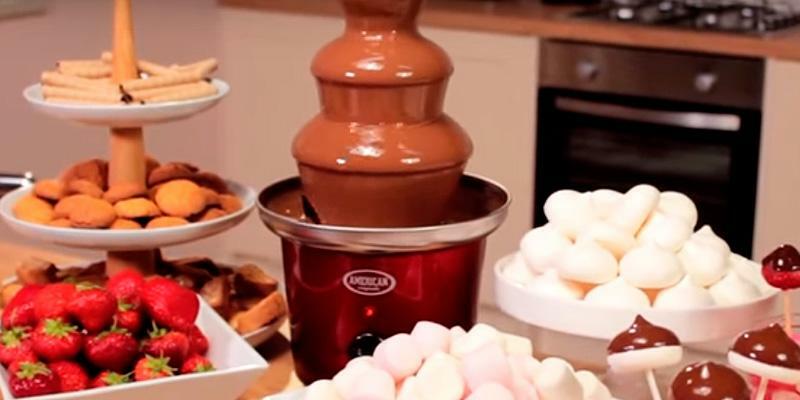 The operation of this chocolate fondue fountain is very simple, even a child can cope with it! However, we recommend you to avoid leaving small children alone near the fountain since it is an electric appliance and, therefore, adult supervision is required. The front panel of the fountain features a mechanical lever with 3 positions: heat only, heat and flow, and shut-off. This model is compatible both with special chocolate for chocolate fountains and with ordinary chocolate (though, it must be pre-melted before poured to the fountain). 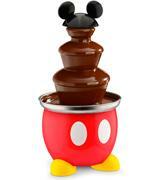 Disney DCM-50 chocolate fountain is convenient and user-friendly. It stands on steady Mickey's feet. You can place a lid that has a shape of Mickey's ears on top of the unit. However, the fountain can operate without it. There is a fountain ON indicator on the front panel. The supply package also includes 4 color-marked metallic skewers convenient for pinning marshmallows, strawberries, cookies, and other sweets. The fountain boasts a reliable design as the whole unit is made of stainless steel. 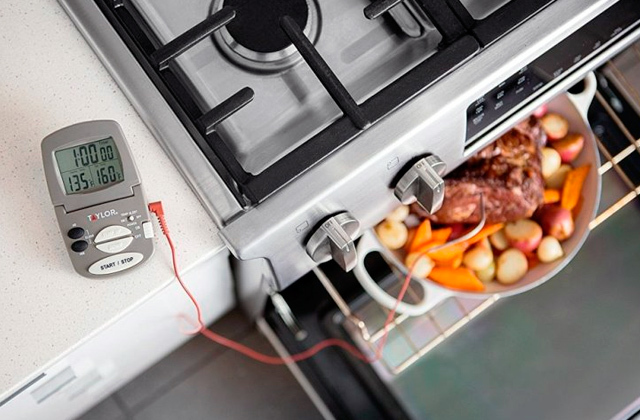 And the stainless steel items are considered the most durable and convenient. The unit weighs 2.7 pounds and you can easily move it or take it outdoors. Sephra Classic CF18L-SST: 11 in. The basic recipe is for 2 bags of chocolate chips and some vegetable oil, but you can improvise. Also, I'd suggest keeping extra supplies on hand because if people eat it down, there can be gaps in the fountain flow. What a hit! the kids asked if we could do it again on the weekend. this fountain is small-ish enough that it was a special dessert treat just for our family. Nostalgia CFF965 will present a gorgeous sweet dainty for most sophisticated guests. The fountain will become an eye-catcher at any festivity or celebration whether it is a birthday, wedding, corporate party, promotional event or simply a friendly get-together. 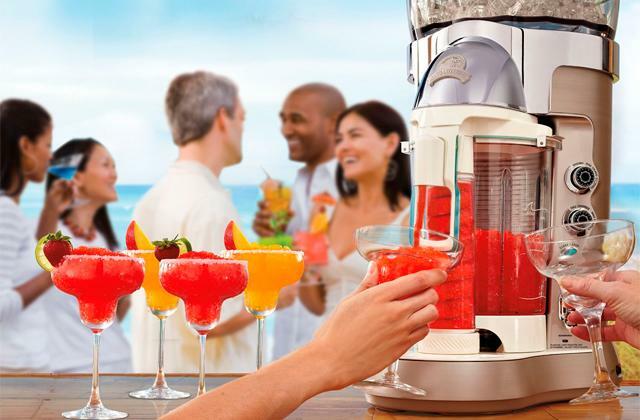 Nostalgia CFF965 is designed for 7-10 persons and will impress you by an easy assembly and no-hassle operation. First, turn the switch to 'Heat' to warm the bowl. Then wait for about 3-5 minutes, pour melted chocolate and turn the switch to 'Heat Motor' setting. Voila! Your chocolate fountain creates a decadent cascade of hot sweetness incessantly falling down each tier. Every guest can create an individual dessert to his or her taste by simply dipping the fruit, berries, cookies or marshmallows into the chocolate. If you notice that chocolate is running out and the party is still in full swing you can refill the fountain without switching it off. Let everyone enjoy your mesmerizing chocolate feast! No doubt, a special chocolate with a high content of natural cocoa oil will produce the best result. And in this concern, Belgian chocolate is considered one of the best for chocolate fountains. 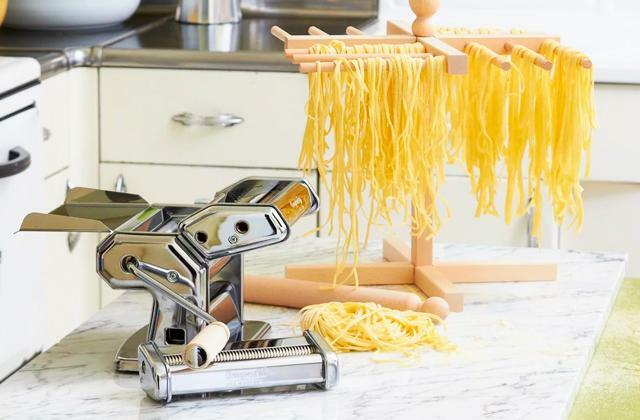 It will guarantee the smooth incessant operation of your unit bringing lots of fun and delight to all you family members and guests. Be sure, your chocolate miracle will turn heads! An array of chocolate types and flavors that will fit any taste (dark, milk or white chocolate with strawberry, caramel, almond, etc.). Cookies, biscuits, waffles, nuts, mini cupcakes, cake pops and even slices of bread. Just mind cutting fruit and other snacks to small bite-size pieces for easy pinning, dipping in melted chocolate and speeding those appetizing cuts of pleasure to your mouth. Too big pieces can cause some discomfort when biting. Besides, there is a risk to get chocolate stains. So, take care of your guests and make the small cuts to avoid abated spirits and dirty clothes. Speaking of berries and fruit, don’t forget to take out the kernels and pits in advance for ultimate convenience and delight of your guests. And finally, serve special skewers and forks for your guests to pin all those incredible dippers and immerse into a chocolate dream! Sephra Classic CF18L-SST: 18 in. It's not too big of a unit, but easily held a bag of the Wilton Chocolate Pro chocolate. Fun when hosting small parties. My guests are suprised to have flowing chocolate to dip fruits and marshmallows in. It is compact and easy to clean. It was easy to use and easy to clean compared to other models. 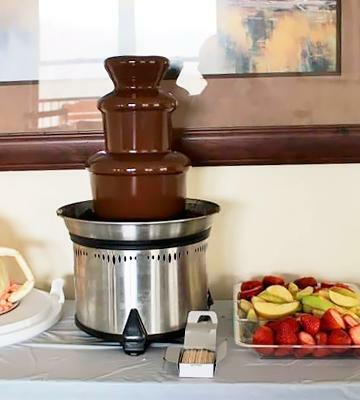 A chocolate fountain is the most extraordinary way to treat your guests with a delicious dessert. Everyone will seek to try some hot chocolate, gorgeously cascading over several tiers. 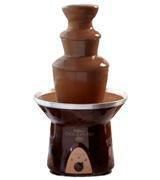 A chocolate fountain is a unit made of several tiers up to 1-4 feet high with hot chocolate circulating over them. It is very simple in terms of operation. Just put the necessary amount of chocolate to the bottom basin with a heating element underneath. Then, pre-melted chocolate is pushed up cascading to the top bowl, where it is heated again and the cycle recurs. 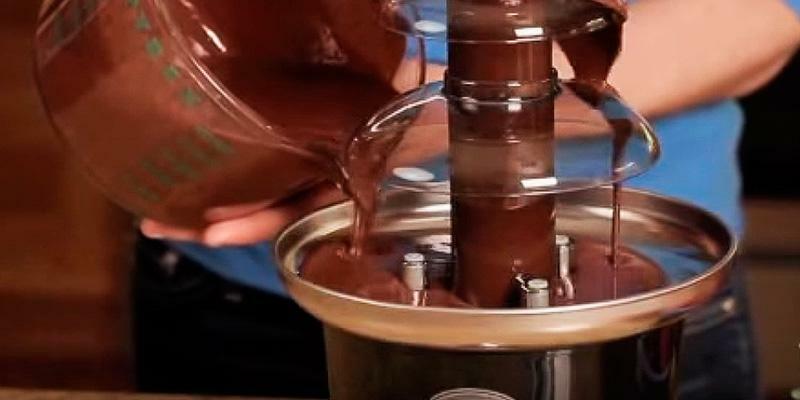 The chocolate fountain machine uses a special kind of chocolate with high cocoa butter content. Mainly, it differs from any ordinary chocolate by a lower melting temperature and a lower viscosity level. It is essential for smooth fountain operation as well as for the convenience of use. At the same time, you can put some ordinary chocolate (pre-melted in a microwave before) mixed with about 3/4 glass of cocoa butter. The fountains are also compatible with cheese, caramel, and various Barbecue sauces. If you are a sweet tooth, we recommend you to consider ice cream makers and waffle makers for creating fabulous desserts within minutes. These parameters mainly depend on the capacity of hot chocolate, height, and the number of tiers. First of all, make up your mind on a number of guests to figure out the required dessert outcome. Sometimes it may be difficult to calculate the right chocolate amount for the fountain since in practice it happens that a group of 10 persons eats 4 pounds and in other cases 6 pounds are too much for 50 persons. Everything depends on the scope of the event, presence of other desserts in your menu and on the guests fond of sweets or, on the contrary, rather indifferent to them. But commonly, 6 pounds is the perfect capacity for 30-40 guests while 2 pounds should be enough to treat 10-15 persons. Also, mind the fountain height while making your choice. The higher the overall construction is and the more tiers it has, the more attractive, magnificent, exciting and spectacular it will look. Usually, the unit features an easy assembly and simple controls. 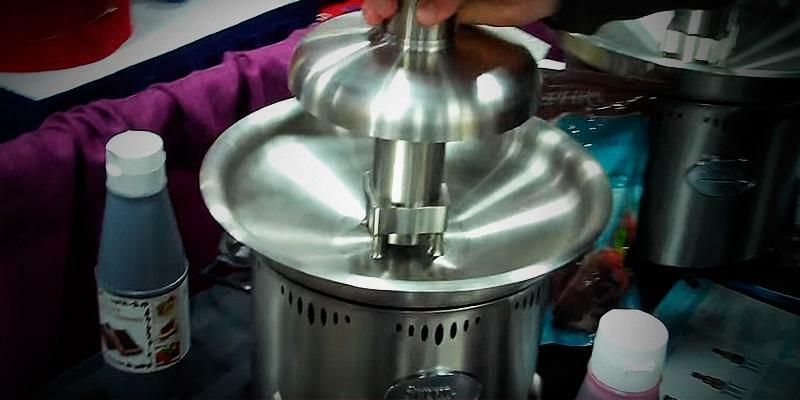 All chocolate fountains have a control switch or a button to turn the heating element on. 3-5 minutes are enough to heat up the bowl and put some chocolate. In some models, this button also activates the motor to make chocolate circulate. But more often than not you will find models with separate on/off and motor buttons. 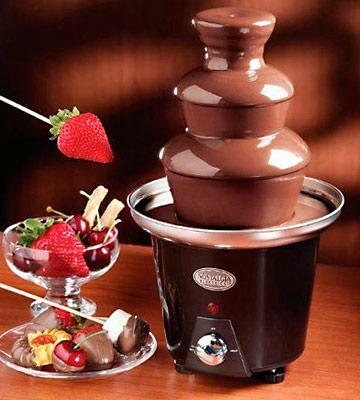 The usability of a chocolate fountain is determined by the material of the unit, its specific features, and durability. Tower and base materials are essential for the overall durability of the appliance. The best material is firm stainless steel. A unit made of steel will serve you for years and become a decoration for many birthdays, weddings and other celebrations. The fountain parts may be made of high-quality heat-resistant plastic. And these plastic analogs are not inferior to the stainless steel parts. Meanwhile, adjustable feet provide perfect steadiness of a unit. And a built-in bubble level will help you pick the smooth and even surface for fountain installation. There is a light indicator showing when the unit is on. The package usually includes color-marked skewers for guests to pin fruit, marshmallow, cookies and other delicacies that will be even better and more tempting with hot chocolate. Another significant issue to consider is the weight of a fountain. Big and heavy units are more suitable for large parties while compact and lightweight models are perfect for home and family events. And finally, mind the convenience of cleaning the unit. Most models offer a dishwasher-safe top part while a bottom part requires hand-wash only. 1. 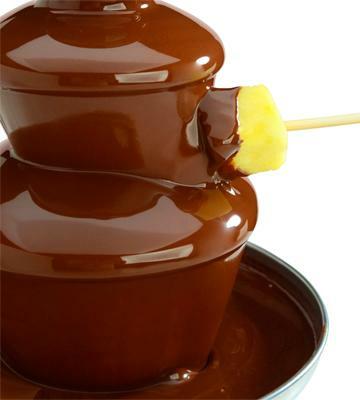 Chocolate Fondue Fountain - Buying Chocolate, Food Editorial. 2. Chocolate Fountain, Wikipedia. August 1, 2016. 3. Chocolate Fondue Recipe, Chowhound. 4. 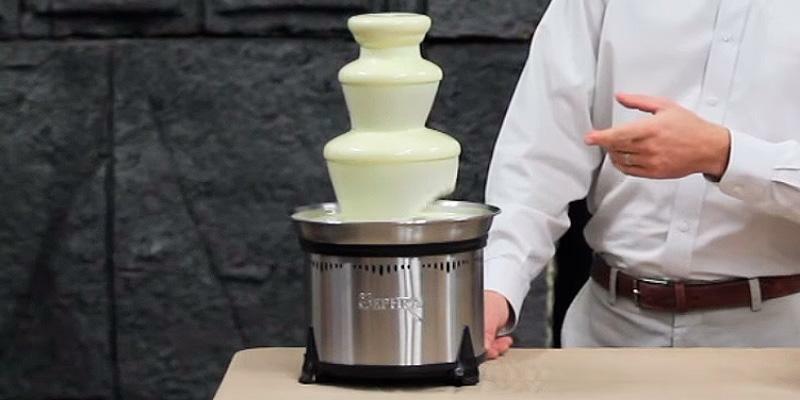 How to Use a Chocolate Fountain, wikiHow. 5. 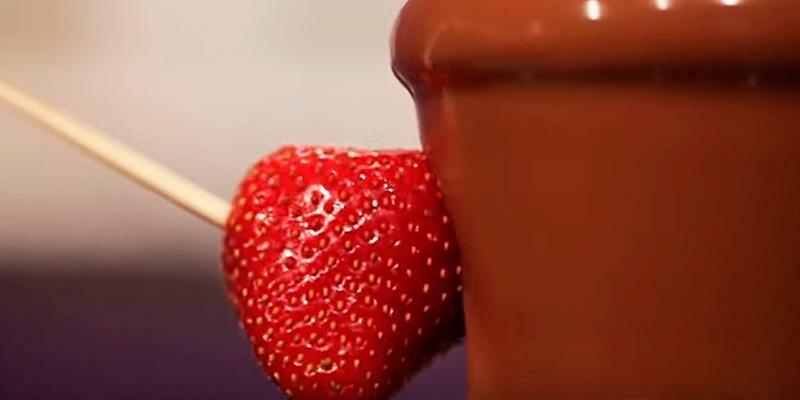 What is a Good Recipe for Chocolate Fountains? Reference. 6. 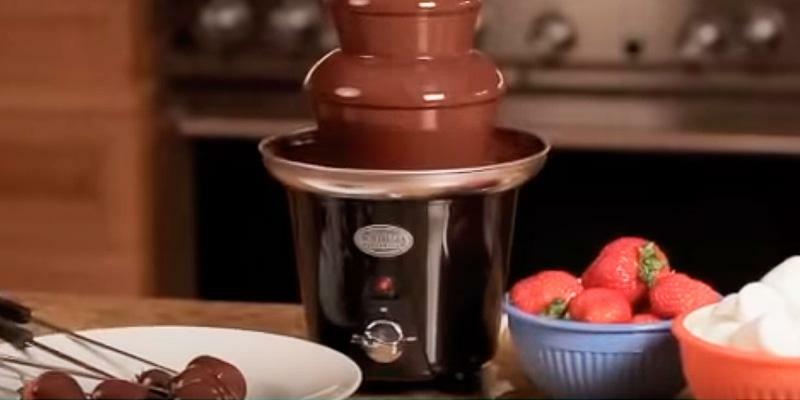 Lauren Wise Chocolate Fountain Party Ideas, eHow. 7. What is the Best Rival Chocolate Fountain Recipe? Quora. July 28, 2016.